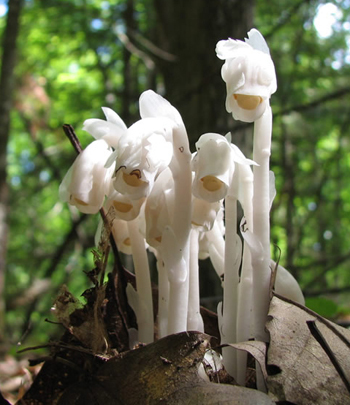 Indian pipe is a unique perennial plant without chlorophyll; a mass of dark, brittle, saprophytic roots produces the ivory-white, waxy stem growing 4-10 inches high and covered with scaly bracts. The stem is topped by a single, nodding, white, pipe-bowl-shaped or bell-shaped flower which turns black when bruised. The whole plant is translucent white. Scalelike leaves nearly absent. Blooms June to October. Grows in dark, rich woods in the temperate and warmer parts of North America. Too scarce to harvest. Maine to the Carolinas, westward to Missouri. Once called “Ice plant” because it resembles frozen jelly, and “melts” when handled. Also called “Bird’s Nest”, in reference to the shape of the entangled root fibers. A good remedy (root tea) for spasms, fainting spells, epilepsy, lockjaw, convulsions, sedative, muscle spasms, St. Vitus dance, and various nervous conditions and may be helpful in remittent and intermittent fever, takes the place of quinine and opium. Mixed with fennel seed, it makes a good eyewash, bunions, warts, gonorrhea, bladder problems, and vaginal douche for vaginal and uterine inflammations. The plant was soaked in rose water, then a cloth was soaked in the mixture and applied to the eyes. The roots are known to be a powerful emetic and one used by Native Americans. Native Americans drank the tea for aches and pains due to colds. Infusion: use 1 tsp. Indian pipe root and 1 tsp. fennel seed with 1 pint boiling water. Steep for 20 minutes and strain. The powdered root: 1/2 tsp., 2-3 times per day. Safety undetermined; possibly toxic. Contains several glycosides.